My family decided a few years ago, when our children were big enough to actually “do stuff”, that we would make a concerted effort to “do stuff” together, creating memorable experiences as opposed to buying presents at Christmas. Last night, as we sat at the kitchen table eating a normal, quiet meal with just the four of us, somewhat recovering from our awesome stay-cation with extended family, the kids shared their favorite moments of the week. “What was your best memory?,” we asked over tacos, predicting it might be the cousin sleepovers or the victory of my daughter’s ski race or my son’s first big air competition. “I loved being on the same snowmobile as Dad,” our son shared thoughtfully, even though in the midst of snowmobiling he was pretty nervous for a kid who enjoys throwing himself headlong into pretty much anything. “Snowmobiling was really fun, but it was so loud,” our daughter added. “Dog-sledding was the best. We saw the land zooming by us, but we were snug and warm under the blankets. The dogs used their legs so it was nice and quiet. But Daddy had to work that day so he could not come with us.” This is true, but it would be an accessible experience one day to share with him, we discussed. So, we did not actually travel anywhere over our February school vacation, yet we had an experience-rich week of outdoor adventure, taking us beyond our comfort zone of just skiing. 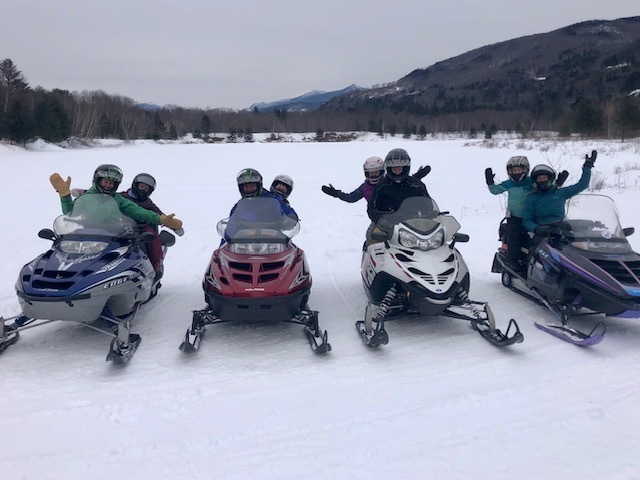 When we were brainstorming experiences back in November, I wondered how Geoff would feel about taking the kids snowmobiling, as that had been what caused his spinal cord injury almost 25 years ago now. “I think that would be awesome for us to do as a family. The kids would love it, and just because that’s how I became paralyzed doesn’t mean I harbor any ill will towards the sport itself.” So, it was decided, and I’ll admit that I didn’t think I would love it. Being on a snowmobile as a kid at my Uncle Karl’s house had always made me nervous, and, like my daughter, I didn’t like loud noises — still don’t in fact. Yet, once we were helmeted up last week on one of the coldest days of winter, I was more excited than any of the kids. We had four adults, four children, and two guides from Out Back Kayak in our party. Soon enough, we were traveling in and around trees and along the railroad tracks that follow our beautiful Pemigewasset River. I’ve lived in northern New Hampshire longer than I’ve lived anywhere else, almost 20 years now, and I’ve never seen the landscape like I did on that day. Geoff was completely relaxed at the helm of his machine, with our nine-year-old riding with him, and it only occurred to me mid-ride that there aren’t a lot of opportunities for Carver to “ride along” with his dad in the spirit of adventure. He has ridden next to him in his bicycle and skis the same trails, but to be attached on the same machine, traveling across nature’s landscape, was powerful. Carver was nervous too, but didn’t have the words to articulate why until later that night, before bed. “Mom, do you think Dad was scared there would be ice and he would break his back again?” I explained that is why we didn’t go at Christmastime because the conditions were not good. When we go on adventures, we always want to make sure we are making good choices about the weather, the gear we need, the experience level of the people we are taking along, etc. “Your daddy was not scared at all; in fact, he was really excited to share that experience with you.” And he really was. Although I view myself more as both a facilitator and participant in and of our life together– the planner, the organizer, the one in charge of implementation, etc., I too was caught up in the actual fun of ripping around the snow through the woods, up and down giant hills and on snow banks along the river. The adults were joking that even if our kids were trying to talk to us, we could not hear them anyway. So, despite the buzz of the motors, the driving along the river was in fact incredibly peaceful. Living that experience with my family is one I won’t soon forget; nor will my husband, children, brother, sister in law or their children either. Mom for the win.